Children from 2018 Polar Capital Starter Event. 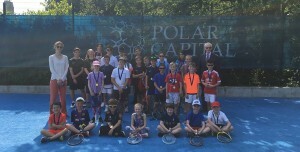 A unique event where all matches have an umpire and all children receive the same price. Left Sara Gurner Polar Capital, right His Excellency the Lieutenant Governor of Jersey Sir Stephen Dalton who presented the prizes. Drills Session, Fitness and Match Play. These are invitational only.